There have been further clashes between Arabs and minority Kurds in north-east Syria, with unconfirmed reports of several more deaths. Turkey's Anatolia news agency said security forces opened fire on Kurds marking the anniversary of the 1988 gas attack on the Iraqi town of Halabja. It said three people were shot dead in Aleppo and four in the town of Afrin. 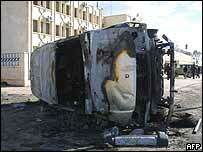 Syrian officials denied there had been any political unrest, but said two people were killed in "tribal clashes". A cabinet statement blamed the trouble on elements seeking to "sow anarchy and sabotage public institutions and private property," the French news agency AFP reported. Syria has an estimated two million Kurds among its 17 million population, concentrated mainly in the north-east of the country. Clashes have erupted in a string of towns in the past few days. The first violence came after a brawl at a soccer match last Friday in Qameshli near the border with Turkey and Iraq. At least nine people were killed and a railway station, schools and public offices were badly damaged. Human rights lawyer Anwar Bunni said at least 300 Kurds had been arrested. The clashes have triggered a wave of protests among Syrian Kurds living in exile. They claim the authorities have encouraged violence against the Kurdish minority in the disturbances.